Super-7: not a prequel to the film Super 8. 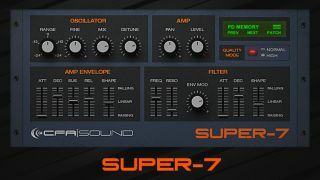 CFA-Sound is celebrating seven years in business by releasing Super-7, a free Windows VST synth that emulates the classic Supersaw oscillator that was featured in Roland's JP-8000 and JP-8080 instruments. The developer admits that his version doesn't sound exactly like the original, but gets "very close". The synth is 32-note polyphonic, and offers a 4-pole lowpass filter and amp envelope. There are 20 presets included, too. Super-7 is available as a free download now from the CFA-Sound website. It's a 32-bit Windows VST plugin.